Celebrate everything you love about winter in one delicious festival. Join us for unlimited spiked drinks and seasonal winter ales from your favorite local breweries. Top local chefs will be on-site selling your favorite winter comfort foods (chili, anyone?) and the music, games & spirits will bring you that just off the slopes feeling (without all the windburn). Awesome local chefs, restaurants, and food trucks will be serving up a selection of comfort classics for purchase. Think red velvet cake jars, lobster rolls, and Greek mac n’ cheese. 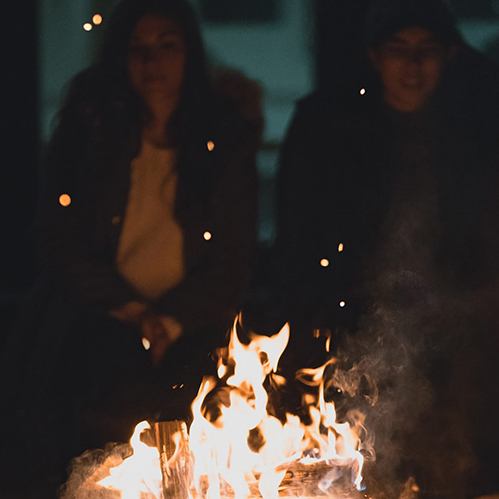 Fire pits, fake snow, DIY hot cocoa and chairlift photo-ops, while bringing those après-ski vibes (without all the windburn). Go VIP for a delicious make your own s’more session. Your favorite local breweries will be pouring their best winter varietals, Kronenbourg 1664 Blanc will be handing out the good stuff, and Mike’s Hard will be reminding you how everything is better when it’s spiked. Please bring your mobile or printed ticket and a valid, government issued 21+ photo ID. Attendees who do not have their ticket or ID will not be admitted to the event and will not be refunded. General Admission ticket holders enjoy two and a half hours of unlimited sips of seasonal craft beer and spiked drinks, live music, games, and a signature tasting glass. VIP ticket holders enjoy a half an hour early entrance, access to a private lounge with specialty cocktails and a s’more making station. WHAT HAPPENS IF I CANNOT MAKE THE EVENT? Tickets are non-refundable, but you are welcome to transfer your ticket(s) to someone else who is 21+. Simply email him or her your digital ticket. Winter Warmer is a strictly 21+ event. IF I GO TO ONE SESSION, CAN I STAY FOR THE SECOND? Attendees must purchase separate tickets for each session. At the end of the first session, all attendees exit the venue in preparation for the second session. You will need a second session ticket if you wish to re-enter. Smoking is not permitted inside the event venue. No outside food or beverages are permitted. You will need to dispose of both prior to entrance. CAN I BUY ALCOHOL AT THE EVENT OR BRING EMPTY OR FULL BOTTLES HOME WITH ME? No spirits may be removed from the festival site, nor are they available for purchase. Whiskey Fried event security reserve the right to refuse admittance of any item deemed hazardous, inappropriate, offensive or suspicious. The NYC Winter Warmer is focused on providing a fun and educational atmosphere for guests to experience new creative drinks and foods. All guests of Winter Warmer are expected to drink responsibly and ensure they have a safe and responsible means of transportation before leaving the event. Any guest who is intoxicated before entering the event, as determined by event security, will be denied entry to the event. Any guest found intoxicated during the event and causing a disturbance, as determined by event security, will be asked to leave the facility without refund and may be subject to further consequences. Thank you for your interest! Drop us a line at hello@cannonballproductions.com. WHO CAN I CONTACT IF I HAVE A QUESTION ABOUT WINTER WARMER? Please email hello@cannonballproductions.com with your information and qualifications, and someone on our media relations team will be in touch. Please email hello@cannonballproductions.com and a member of our sponsorship team will be in touch.